This is the time of the year when the church staff is fully engaged in planning, developing, promoting, practicing, implementing, and praying over the new programs that will begin in the next couple of weeks. Along with the lay leadership who have also invested a great deal of time and energy, everyone is working towards the exciting reveal of new discipleship opportunities, Bible studies, service projects, Christian education for our children and youth, and fellowship. Last summer with the help and the resources of our United Methodist Church District office and a process of assessment and recommendation called Next Level Innovations (N.L.I. ), our Sunday worship experience was modified and the mission to reach out into our community and make more disciples of Jesus Christ began. Also included in those recommendations was the task of clarifying staff alignment, primary job responsibilities, developing and implementing a communications plan, developing and implementing a plan for leadership training and recruitment, and developing and implementing a plan for volunteer recruitment, training, and appreciation. The most recent additions to our church staff were either new or revised positions recommended by the N.L.I. report. Vincent Williams is our new Director of Discipleship. This position is new to our church and resulted from the recommendation to create a position the NLI referred to as the Director of Connections, a title that was later changed to Director of Discipleship. In this new role, Vincent will connect people of all levels of faith to the path of discipleship, helping us to reach out into our local Sterling community, engaging members and volunteers in Christian education and service, connecting with our new members and guests and ensuring their experience at SUMC is welcoming and fulfilling. 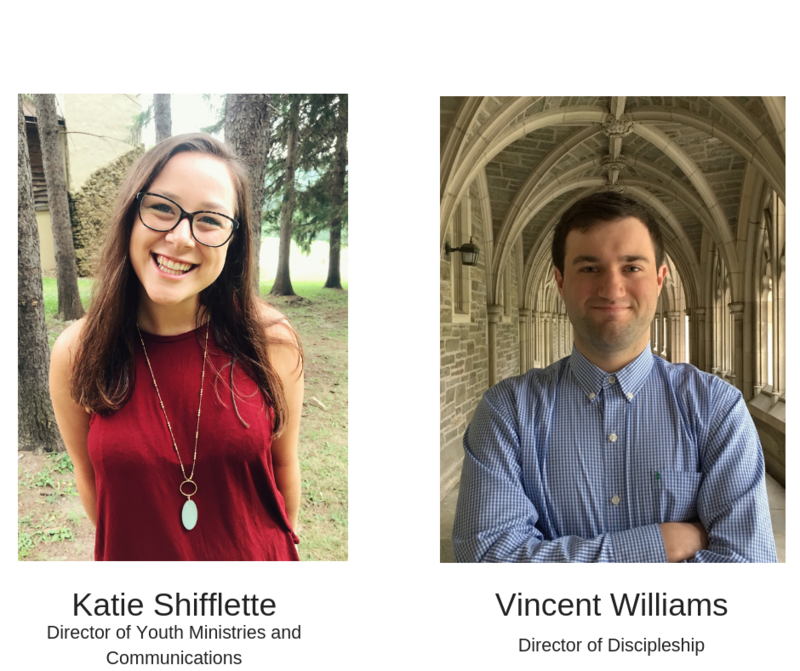 Katie Shifflette, Director of Youth Ministries and Communications, fills a role left vacant last November when then Youth Director Nick Yother left to return to Georgia. We are very excited to have Katie on board just in time for the new 2018/2019 school and worship year and she is already making changes that will impact our youth. This year’s Confirmation class will include students in the 6th grade as well as the 7th graders and above when study begins on September 9. And there will be a class for the 8th graders and high schoolers starting that Sunday morning and the Life Signs Youth Group will kick off their new year activities that evening. In addition to youth ministries, Katie’s role includes supporting the communications recommendations made in the N.L.I. report, adding to a team that includes Curt Christiansen, Director of Operations, and Heather Toth, Director of Children’s Ministries. There is much going on inside Sterling United Methodist Church so please join us on September 9 for worship at 9, 10 (Spanish language), and 11 AM. Participate in our Growing Deeper at Ten discipleship hour and bring the kids for our new Deep Blue Kids Sunday School, Confirmation class, or the studies for the older kids and youth group. Then stay to celebrate at our Fall Fiesta with food, fun, and fellowship. All are welcome!